Kit Harington will host "Saturday Night Live" on April 6 with musical guest Sara Barielles. 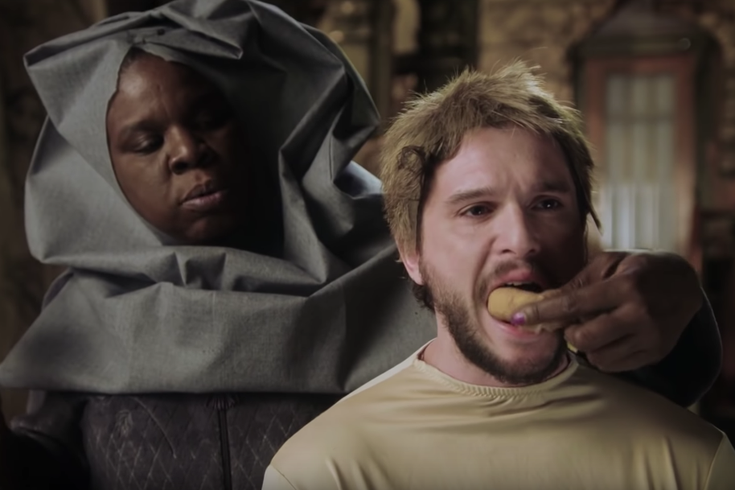 In the new promo for this week’s "Saturday Night Live," Leslie Jones somehow tricks Kit Harrington into participating in her “Game of Thrones” fantasies. We see Jones playing with figurines and a dragon-head puppet, trying her hardest to recreate some sort of battle along "The Wall." But it gets a bit more intense when she jumps character to Daenerys Targaryen and we find her sitting on some sort of cardboard “iron” throne. “I assume, my lord, you are here to bend the knee,” she tells Harington, who's in character as Jon Snow wearing jeans and oven mitts. In a "GOT" approved tone, he says, “I am not," before losing character to ask what they’re doing. “I’ve been here for four hours,” he says, before adding, “Is this even for the show?” After admitting she tricked him, Harington throws his mitts to the ground and proclaims he’s done. But Jones gives a hearty warning that the actor quickly challenges. This will be Harington's first “SNL” hosting gig - and given the intensity of this new promo, I think we can safely bet on some pretty decent “GOT” sketches. Harington will host "Saturday Night Live" this Saturday, April 6, at 11: 30 p.m. on NBC, with musical guest Sara Barielles.